Nicholas Canellakis. Photo from Frankly Music. Frank Almond and five friends come together for an all strings chamber concert Monday, May 14 at Wisconsin Lutheran College to close the Frankly Music season. Almond has showcased a variety of chamber music forms by inviting performers with sterling reputations to join together in a evening of collaborative music. When solo turns, duets, trio and other combinations are involved, rehearsals may be simpler than the challenge of this evening. The ensemble will play two works for string sextet — requiring a mind-meld of all six players. Violinist Almond and MSO colleague Ilana Setapen have worked in the past with violist Toby Appel. Three of the players, cellists Nicholas Canellakis and Alexander Hersh join violist Helen Callus in making their Frankly Music debuts. Almond observes that he selects performers who “are open to exploring the pieces” but that he is “still guessing that this is going to work.” For Frankly Music concerts, it always does. A work written for two soloists — violin and viola backed by orchestra — becomes a well-balanced chamber work.. Retitled, Grand Sestetto Concertante, the sextet version distributes solo roles by violin and viola across all six players. The other string sextet on the program was written by Johannes Brahms early in his career, in part, it has been suggested, because it was a rare form that would not invite a comparison to Beethoven. Brahms was a pianist, Almond observes. He sought to “learn how to write for string players. There were likely many versions.” (Brahms had a reputation for rewriting — and destroying many works he was not satisfied with.) The result was a “fully formed and very convincing work of art,” Almond says. With Sextet No. 1 in B-flat, Op. 18, Brahms demonstrates his sensitivity to varying dynamics by balancing six string players to create themes of great beauty and motifs that add momentum without fireworks. Passages contrast the four highest strings with the four lowest – with the violists contributing to both. Pairs of like players share a section, but rarely double. Both works honor the unique character of a chamber work. A symphony or chamber orchestra tends to focus on an ensemble sound. These sextets expose the players in conversation. With glorious results. The Frankly Music concert begins at 7:00 p.m., Monday, May 14 at Schwan Concert Hall at Wisconsin Lutheran College, 8815 W. Wisconsin Ave., Wauwautosa. Tickets ($35 reserved seating – $10 for students) may be purchased online or at the door. Free parking is available in a parking garage to the east of the hall. Fun fact. 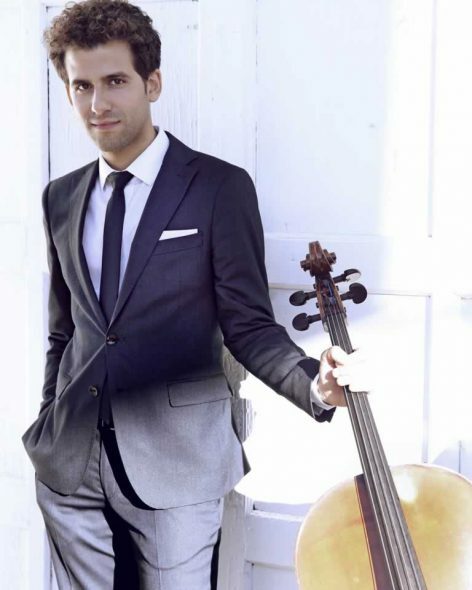 First time guest cellist Nicholas Canellakis is the brother of conductor Karina Canellakis, appearing in two September concerts as guest conductor of the Milwaukee Symphony Orchestra.